2. Arrange slices of bread on two 15" x 10" jelly roll pans. Bake bread 12 minutes or until it is lightly toasted. Remove bread from oven, then reduce heat 350° F.
3. Cut bread into 1/2" cubes. 4. In large saucepan, melt margarine over medium heat, add onions and celery Cook 8 minutes or until the vegetables are tender, stirring frequently. Remove from heat. 5. Mix toasted bread cubes, poultry seasoning, thyme, rosemary, salt, and pepper into saucepan. 6. In small bowl, mix cranberries and sugar substitute. Toss into bread mixture. Drizzle chicken broth into saucepan; mix well. 7. Coat roasting pan with cooking spray. 8. Remove giblets from turkey. Rinse outside of turkey and cavity with cold water; pat dry with paper towels. 9. Loosely fill turkey cavity with stuffing. 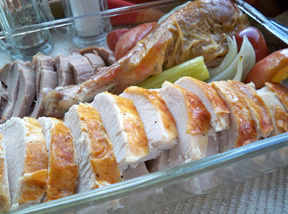 Place turkey in roasting pan breast side up. 10. Bake 3 hours or until meat thermometer inserted in thickest part turkey thigh reads 180Â°F and juices run clear. 11. While turkey is baking, coat oven proof baking dish with cooking spray. Spoon remaining stuffing into dish. Cover and refrigerate. 12. Remove turkey from oven. Increase oven temperature to 375° F.
13. Transfer turkey to carving board. Let rest 20 minutes. 14. Place dish of stuffing in oven. Bake 25 to 30 minutes. 15. Remove and discard skin from turkey. Remove stuffing from turkey and place in serving bowl. Slice turkey and serve with stuffing.